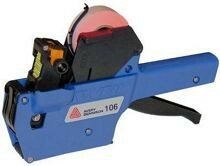 The Avery Dennison 106 Price Marking Gun has 1 line of 6 characters. It's great for simple price marking or coding applications. It is fairly light weight and has a smaller profile than many other price marking guns.